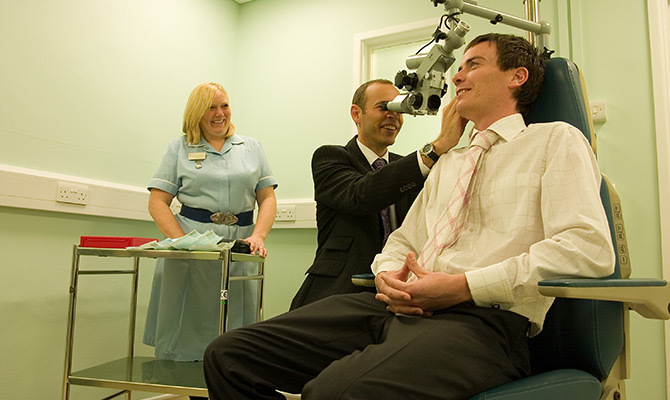 The cutting-edge facilities for treating Ear, Nose and Throat (ENT) conditions at The London Road Clinic are amongst the best private healthcare has to offer. If you wish to make use of any of the services listed below, or if you have any other special requirements for your visit, please do not hesitate to ask a member of our team for assistance when booking your appointment. The London Road Clinic has disabled access round the rear of the building in the car park which is accessible from Saxby Street. The consultation and treatment rooms are all on the ground floor and all on one level. If you are a blue badge holder we can save you a dedicated space in our car park, closest to the door of the clinic. If you require a wheelchair, the clinic has one you can use for your appointment, a staff member will ensure this is ready for you on your arrival. If you are hard of hearing, the clinic has a loops system that hearing aid patients are able to use whilst in the clinic, some staff are also trained in sign language. Guide dogs are welcome and assistance offered for our patients who have impaired sight. If English is not your first language some of our staff are multi lingual, or an interpretation service can be arranged for your appointment. We have baby changing facilities and welcome nursing mothers in all areas of the clinic, a private room is also available should this wish to be used also. We have a dedicated room available for patients who may want to use for the purposes of prayer. You are welcome to bring family members with you that are welcome to join you in all consultations, treatments and investigation appointments should you wish. If you should require a chaperone for any of your appointments this can be arranged for you, all staff are trained in chaperoning and available at all times the clinic is in operation. For further information about the Ear, Nose and Throat (ENT) facilities at The London Road Clinic, or information about our ENT consultants and ENT treatments, please contact us.